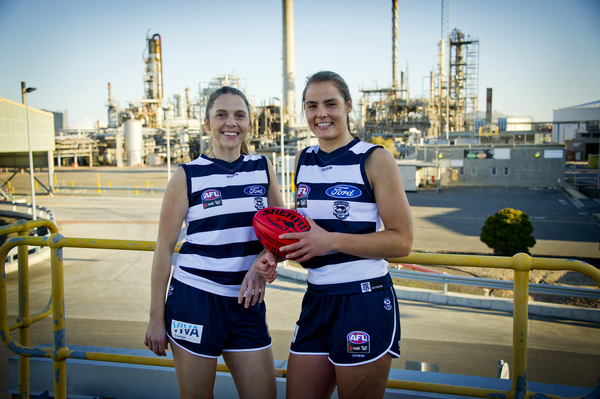 KITTED OUT CATS: Cats AFLW players Anna Teague and Maddy Boyd wearing the new Viva Energy kit. Geelong’s VFLW team received a massive boost during the week with the announcement of a new sponsor and three key player re-signings. Hayley Trevean, Mia-Rae Clifford, Hannah Burchell and elite partner Viva Energy have officially signed on for 2019. The Cats take on NT Thunder in a first semi-final at Stannards Stadium, Port Melbourne, on Sunday at 11.45am. Trevean was a member of the Cats first ever women’s team and has played 18 games for Geelong over two seasons. Clifford joined the Cats after a long career with St Kilda Sharks and has booted 14 goals in as many games this season. She played all seven games with Melbourne in the inaugural AFLW season. Ocean Grover Burchell has also worn the Cats guernsey for the past two seasons. Burchell has played all 28 games for the VFLW Cats and has kicked 11 goals. Coach Paul Hood welcomed the signings. “Hayley brings AFLW experience, terrific skill and competitiveness to our group,” he said. “Hayley has set the tone amongst our program for contested possession and forward pressure in her time so far, she has a great football brain and puts her teammates first on and off the field. “Mia-Rae brings a wealth of experience from her time at Melbourne’s AFLW side and the St Kilda Sharks. “A passionate Geelong fan, Mia-Rae wears her heart on her sleeve on game day and has developed this season into a terrific contested forward threat with the rare ability to win the ball in the air, on the lead and on the ground. “Her goal scoring this season has knocked down the door for her AFLW squad selection. “Hannah is a highly skilled outside midfielder with terrific two-way running abilities. She is also just as comfortable supporting the defence as she is getting forward to create scoring opportunities. Geelong Cats chief Brian Cook was rapt with the Viva Energy’s commitment. “We’re thrilled at Viva Energy’s commitment to the Geelong Football Club, I want to thank Viva Energy for their support and belief in our inaugural AFLW team, our women’s football program and Next Gen Academy,” he said. Meanwhile, Geelong’s VFL side will meet Casey Demons in a qualifying final tomorrow. The game at Casey Fields starts at 2.10pm. Several Cats players, including Esava Ratugolea, will try to stake a claim for a spot in the senior team which plays Melbourne in an elimination final on Saturday week.